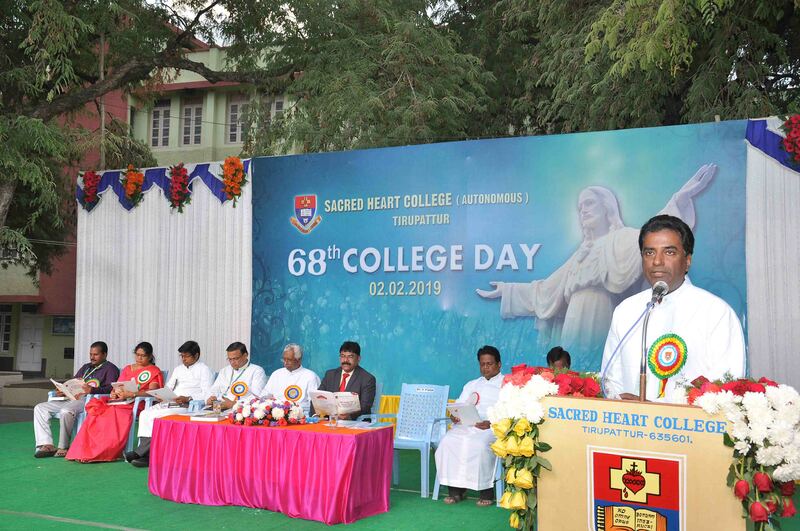 The 68th College Day Celebrations of Sacred Heart College (Autonomous), was held on 2nd February, 2019, in the college ground, at 5.00. P.M.
Rev. Fr. 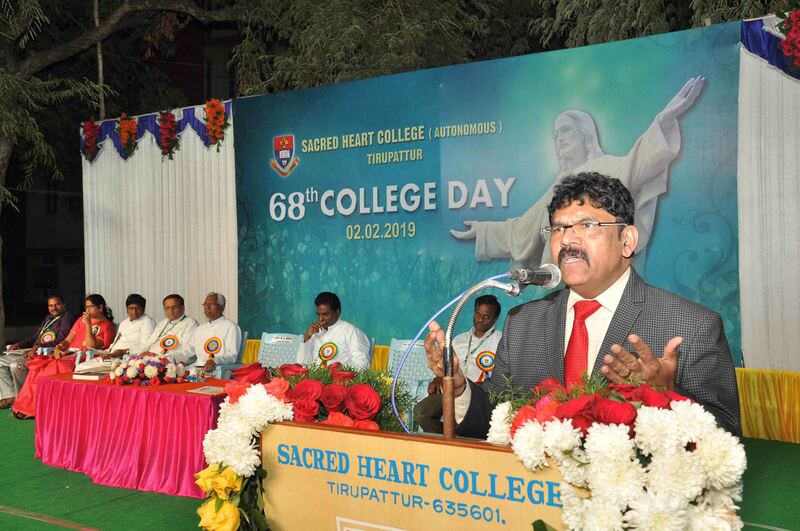 Dr. C. Antony Raj, the Rector of the college welcomed the gathering. Rev. Dr. D. Maria Antony Raj, the Principal of the college read the report of the year. 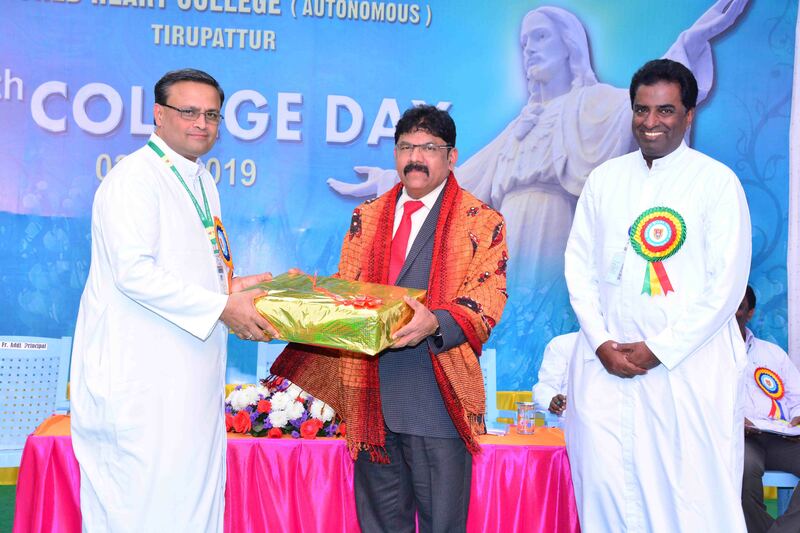 Prof. Dr. K. Muragan, Vice Chancellor, Thiruvalluvar University, Serkkadu, Vellore, was the Chief Guest. He felicitated the gathering and distributed prizes to the faculty and staff for holding various capacities at the college level. Awards and scholarships were given to students for their excellence in studies, sports, NCC and other accomplishments. The Chief Guest was overwhelmed with the various facilities, infrastructure, teaching, learning and meritorious achievements of the college. He emphasized the importance of bio-diversity and stressed the importance of the butterfly and the honey bees which act as a natural pollinizer in embarking a fruitful and habitable environment. He stated that our country is one among 10 mega bio-diversities. In his speech the chief guest stated the dangers of stagnate water which pays way for the breeding of mosquitoes and the cause of many diseases. He insisted on the importance of research to be done on eradicating the widespread of disease caused by mosquitoes. He appreciated the state government on its ban of plastic and urged the faculty, staff, students and parents to avoid the use of plastic bags and adhere to a clean and green environment. He concluded by motivating students to take up various public service examinations and enroll in state and research funded research agencies. Rev. Dr. K.A. Maria Arokiaraj, Additional Principal, Rev. 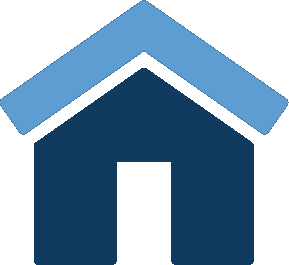 Dr. Praveen Peter, Vice Principal, (Admin. Shift I)/Controller of Examination, Rev. Dr. G. Theophil Anand, Vice Principal, (Admin. Shift II), Rev. Fr. John Borg, Administrator, Rev. Fr. Daniel Ambrose, Director, Extension Education & Services, Rev. Fr. Selvaraj Varaprasadam, Asst. Prof. in Counselling Psychology, Rev. Fr. Isidore Mani Lazar, Campus Minister and various Deans, Heads of the Departments, faculty and students graced the occasion. The college choir was orchestrated by Rev. Dr. G. Theophil Anand who also delivered the vote of thanks.